Two Minor League ballpark groundbreakings occurred in February: Wichita, Kansas (left), and Fredericksburg, Virginia. January's Batting Around column featured a rundown of 2020's four new Minor League Baseball locations: Madison, Alabama; Kannapolis, North Carolina; Wichita, Kansas and Fredericksburg, Virginia. Construction is now underway on all four facilities. Madison will host the Southern League's Rocket City Trash Pandas, who are relocating from Mobile, Alabama, where they play as the BayBears. The city was the first of the 2020 crop to break ground, with a ceremony taking place last June. Kannapolis, the only new 2020 ballpark to host a non-relocating team (the soon-to-be-renamed Intimidators), followed suit with a ceremony of their own in October. Wichita and Fredericksburg, meanwhile, both put shovels in the ground during the month of February. Wichita, which will host the relocating New Orleans Baby Cakes of the Pacific Coast League, began construction on Feb. 13 (one day after Wichita City Council approved the first round of building). The $75 million ballpark is expected to be completed by March 2020. As noted by Kansas.com, "As part of its design-build process, the project has been split into nine different phases that will come with maximum guaranteed prices in an ongoing negotiation between developers and the city." Jeff Fluhr, president of the Greater Wichita Partnership, told the website that the ballpark will "make us that great American river city." Wichita last hosted Minor League Baseball in the form of the Texas League's Wichita Wranglers, who departed for Springdale, Arkansas, following the 2007 season. The Wranglers' home of Lawrence-Dumont Stadium was demolished in order to make room for the new ballpark. 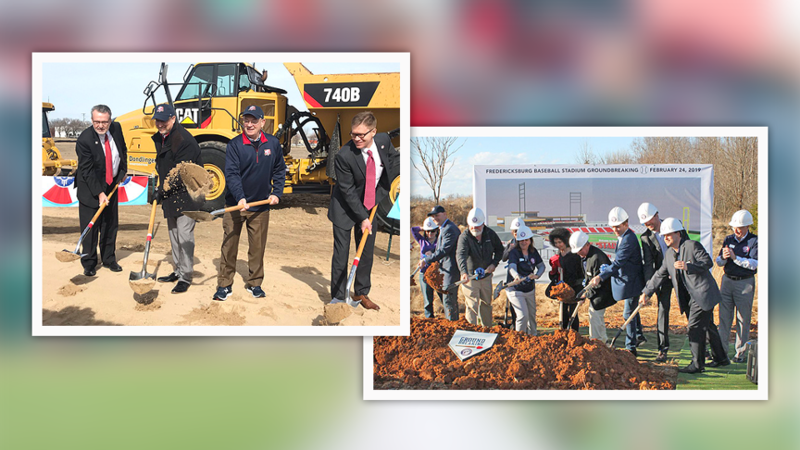 On Feb. 24, the city of Fredericksburg held a groundbreaking ceremony attended by approximately 1,000 guests. This facility will be home to the relocating Potomac Nationals, who currently play 32 miles north of Fredericksburg in Woodbridge, Virginia. The $35 million ballpark is being funded by the team, with the city agreeing to pay $1.05 million a year over a 30-year period to, per Fredericksburg.com, "lease the stadium for concerts and other events. The city plans to cover its commitment through proceeds generated by the stadium." The Potomac Nationals have one season remaining at Pfitzner Stadium, which opened in 1984. The ballpark in Fredericksburg marks the culmination of a years-long effort by owner Art Silber to find the team a new home. The Florida State League's Dunedin Blue Jays will spend the 2019 season at Clearwater's Jack Russell Memorial Stadium due to extensive renovations scheduled to take place at Dunedin Stadium (which is also the Spring Training home of the parent Toronto Blue Jays). Jack Russell Memorial Stadium, which opened in 1995, is the former home of Philadelphia Phillies Spring Training as well as the former home of FSL's Clearwater Phillies (now the Threshers). While the ballpark has continued to host various amateur teams and events, its grandstand was demolished in 2007 and current capacity is only 1,200. Dunedin will play 62 of its home games at Jack Russell Memorial Stadium, with the remaining eight taking place at the visiting team's stadium. Tickets for all games will cost $5. There is precedence for this situation in the Florida State League, as in 2016 the Lakeland Flying Tigers played at Henley Field due to renovations at Joker Marchant Stadium. The Appalachian League's Elizabethton Twins were established in 1974, and since then they've maintained the same name and affiliation while playing out of the same ballpark (Joe O'Brien Field). That tradition continues in 2019, but with one notable change: For the first time ever, the team will not be run by Elizabethton's Parks and Recreation Department. On Feb. 14, Elizabethton City Council voted unanimously in favor of having Boyd Sports run the team. Boyd Sports operates two other Appalachian League teams (the Johnson City Cardinals and Greeneville Reds) as well as the Southern League's Tennessee Smokies. At the same Feb. 14 meeting, City Council also voted to approve alcohol sales at Joe O'Brien Field. In other Appy League news, political leaders in Bristol, Tennessee, are looking into the possibility of building a new ballpark for the Bristol Pirates. The Pirates currently play at Boyce Cox Field, just across the state line in Bristol, Virginia. Meanwhile, the Pulaski Yankees have announced the latest round of renovations to Calfee Park. The renovations, scheduled to be completed prior to the start of the Appalachian League season, include new seating on the third base side of the ballpark as well as a three-tiered left field party deck. SRP Park, home of the South Atlantic League's Augusta GreenJackets, was the only new Minor League ballpark to open in 2018. The facility, located in North Augusta, South Carolina, across the Savannah River from the team's previous home of Augusta, Georgia, is the centerpiece of the Riverside Village development project. The Clubhouse, a 32-unit apartment building and one of the key components of this project, celebrated its grand opening on March 7. Each of the units in The Clubhouse features a direct view of SRP Park.